Finally the day was there, after two month of planning, many things to keep in mind and a lot work – 16 people where meeting for breakfast in the heart of Hamburg. The excitement was visible in every face and everyone just wanted to start our journey. 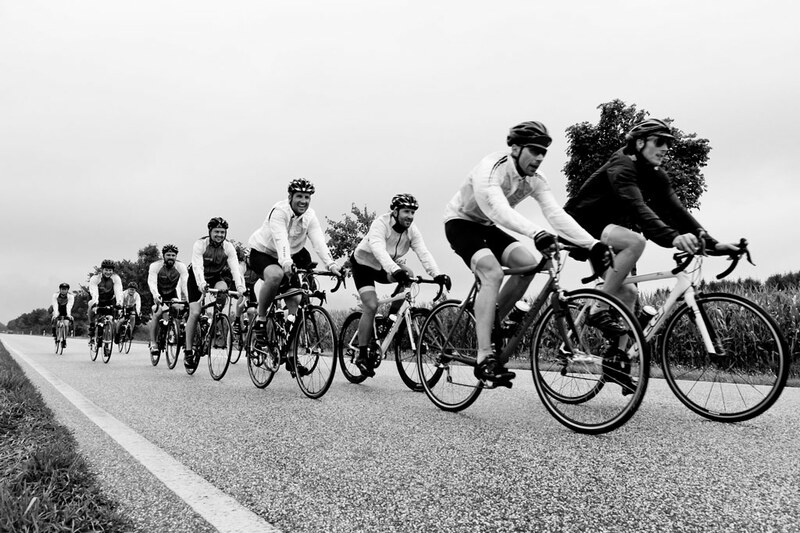 After setting up all the bikes, packing the van for the first time and getting ready for the first stage – it also started to rain. The first approx. 130 km where really wet and nothing you’d expect from a vacation trip. But the team battled it out with the elements. Sadly I had to resign the first stage after approx 75-80 km, being in the lead for the first kilometers and with a hurting knee, I decided not to exaggerate. There are more stages and kilometers to come. But the route compensated for everything. As said above, I rode just 80 km of the 120 km of this first stage! We had some wet cobble stones, empty field roads with great pavement, sheeps and in the end the north sea, the dykes and also the sun bid welcome to use while we arrived at our first camping site. In less than 15 minutes our eight Heimplanet tents where set up and our home for this night was prepared. A shower, the bikes where cleaned, some warm cloth and we made our last stop for this day and visited a weird italian pizzeria to get some food. Let’s see what the 2nd stage from Büsum to Skaerbek has to offer. The weather forecast looks pretty good so far…. See more impressions after the jump and also head over to www.rad-race.com for even more insights. Our Tour de Skandinavia starts today and it’s going to be a great adventure for all of us. We will spend the next 1,5 weeks mostly in the scandinavian outdoors and need to be well prepared. 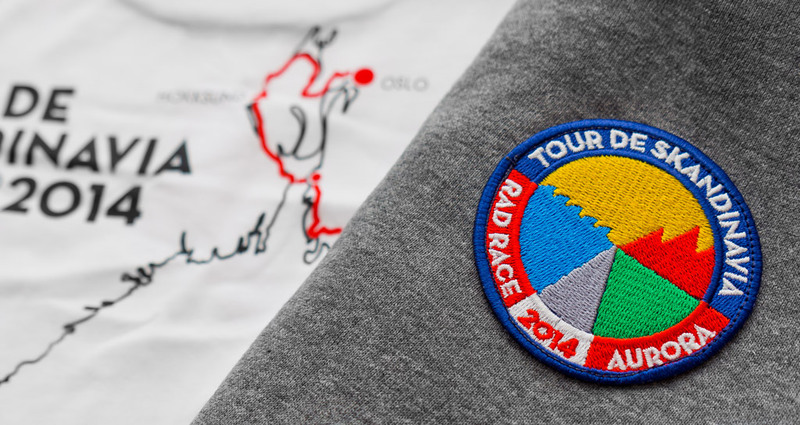 To give you a idea about what we take with us, this is a glimpse on our Tour de Skandinavia team gear. Well, it’s not really everything, there is much more. This selection shows a package we made for each and every rider to make sure everyone is well-prepared for the weather in scandinavia in september. 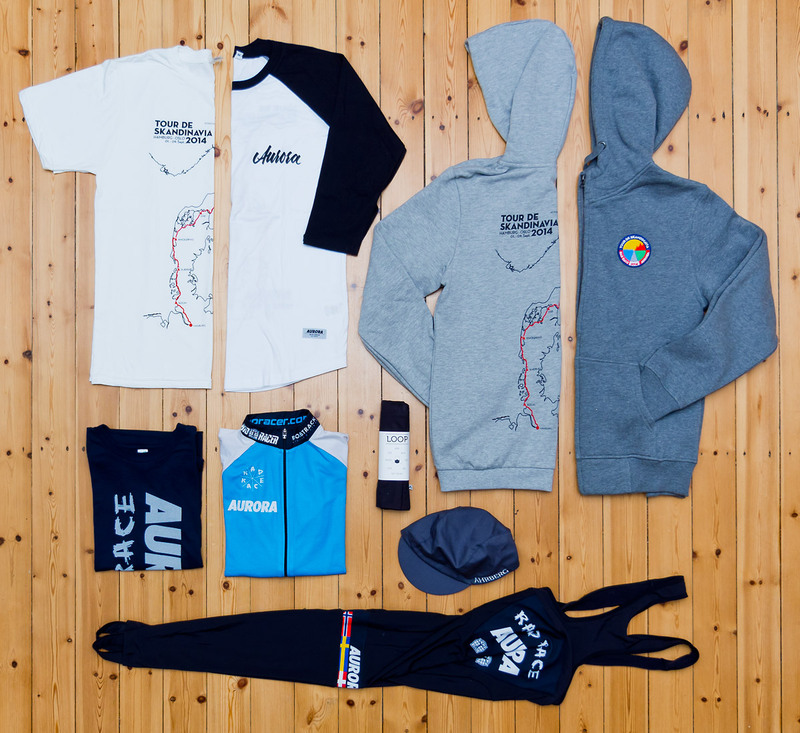 Besides our AURORA x Rad Race Teamkit, which was Made by Bioracer, there are some T-Shirts, a Longsleeve and two Hoodeds to keep everyone warm – especially off the bike. And last but not least, Ahrberg top this off with his genius „Loop“, which will definitely keep us warm on colder rides/days, and his comfy Cycling Cap. It’s time to announce something really big! Together with Ingo, founder of the Rad Race, I worked the last two month to organize a very special journey. Both of us where dreaming of a tour like this for long and it was time to finally realize it. 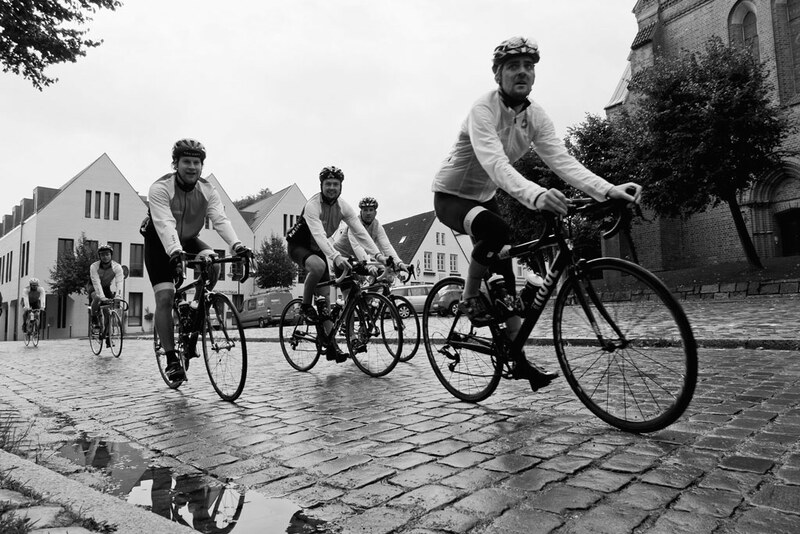 We will ride from Hamburg to Oslo in 9 days and sleep in our Heimplanet tents between every stage. Our crew consists of sixteen people and thirdteen of them will ride the approx. 1200km on their road bike or track bike. The rest of our crew will follow in our tour van and take care of us and the equipment. We will also try to document the tour as good as possible with our cameras and hope to get back with some nice visuals for you. This is going to be a really interesting experience, a challenge for everyone of us and a beautiful journey with stunning landscapes. Riding with the nature and see what it has to offer, no matter if it’s rain, wind or sunshine. 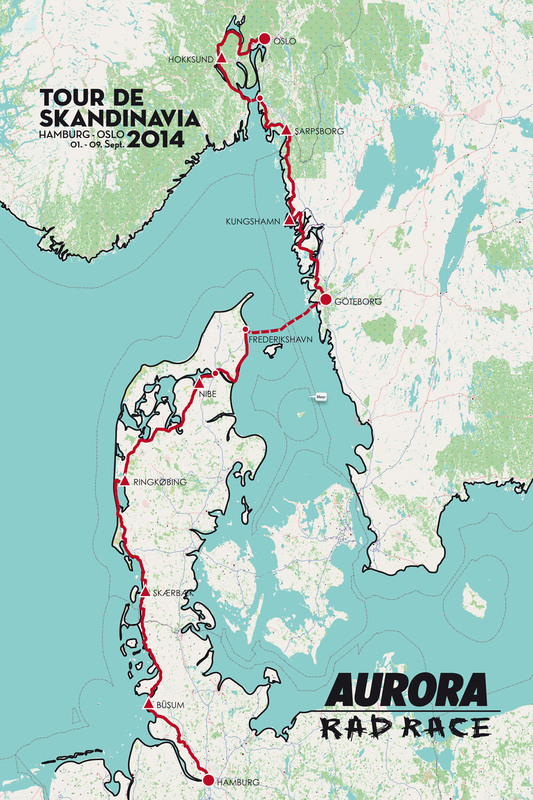 On 1st of September we start the tour in Hamburg, will ride our way on the west coast of denmark and arrive in Frederikshavn, there we cross over the Kattegat with a ferry and reach Göteborg. The tour continues on the west coast of Sweden, we cross the Oslofjord and finish right in the heart of Oslo. Check out this graphic to get a idea about our route. These are the scheduled stages, if you are around somewhere, contact us and feel free to join us! Besides a lot work and our privat effort, we are very happy that some friends/companies help us out with gear and support. As mentioned above – Heimplanet takes care of our sleeping-place, Ahrberg covers us with eco-friendly cycling accessories, together with Bioracer we produced our limited Tour de Skandinavia Teamkit, CLIF Bar provides us with the best energy bars available and helps us to keep our stamina during every stage, Kenda supplies us with all the rubber we need and last but not least Bombtrack provides us with two of their bikes! We can’t wait and just want to get on our bikes and start this tour. During the whole tour you will find updates, pictures, thoughts and much more in the AURORA blog.